Pentowo is a great place to spend a summer holidays in for all bird lovers. This charming corner along with the city of Tykocin is a holder of a prestigious title of The European Stork Village. This title was given in 2001 by a German found EURONATUR. According to the foundation principles/ regulations, such a title may wear only one place in each country. The history with the storks in Pentowo started by a hurricane, which hit this area in 1991. The wind damaged a lot of trees around the farm. Because of our perfect location – close to feeding areas, storks started to show up and Built nests at the broken tops of those trees, than they moved on the buildings, electricity poles. Now we have them all around, even on the top of observation towers they made a nest. Sometimes when the nests are falling apart, we built the platforms in the same place so it can hold the nest more stable. 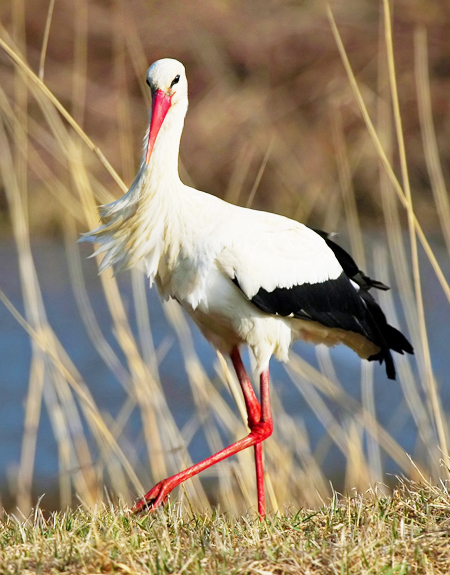 Last year in Pentowo was over 36 stork couples. European Stork Villages Network In the 90s, the European Natural Heritage Fund nature (EURONATUR) came up with the title of “European Stork Village” to those municipalities that besides having a strong presence had made significant efforts to white stork protection and conservation of the breeding areas. This title, which was granted once per year and country. The first location was awarded Cigoc, Croatia, in 1994. By today we have 10 official European Stork Villages all over Europe last one was awarded in 2011 in Turkey – Eskikaraagac.